BEGINNERS START HERE!! Miniature needlepoint is easier than you think! Have you ever considered doing miniature needlepoint embroidery, but then decided that it must be too difficult, that it’s probably not for you? Think again! It’s really much easier than you would imagine – just follow the tips in these online tutorials, and you’ll be stitching tiny things for your doll’s house in no time! This part of the website has been designed to tell you everything you need to know about how to start doing miniature needlepoint: what equipment you need to get started, how to master the stitches, as well as hints and tips on how to finish all the various kinds of Janet Granger needlepoint kits that we produce for doll’s houses. Whether you want to know how to do the fringing stitch that puts the finishing touch on a doll’s house carpet, or how to mount canvas in a rotating roller frame, to how to make the hanging tabs for a Tudor wallhanging – you’ll find all the answers in this section! 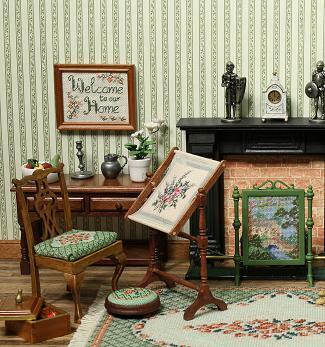 Just choose from the Tutorials listed below, and you’ll soon be a miniature needlepoint expert, able to make all kinds of wonderful things for your miniature doll’s house or room setting.